“Have You Recently Run A Living Social Campaign? Would You Like To Recover Some Of Your Lost Profits From Offering That 50% Discount AND Splitting Your Remaining Profits 50/50 With LivingSocial.com? 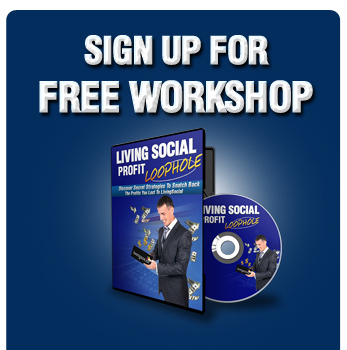 Easy strategies to recover some of the profits you already lost by running your LivingSocial.com campaign. Dozens of insider strategies to almost guarantee that you actually make money from your LivingSocial.com campaigns. The lethal mistakes that business owners make with LivingSocial.com that almost forces them out of business. How to run profitable discount coupon campaigns with companies like Living Social and more! "Download Today While Supplies Last!"